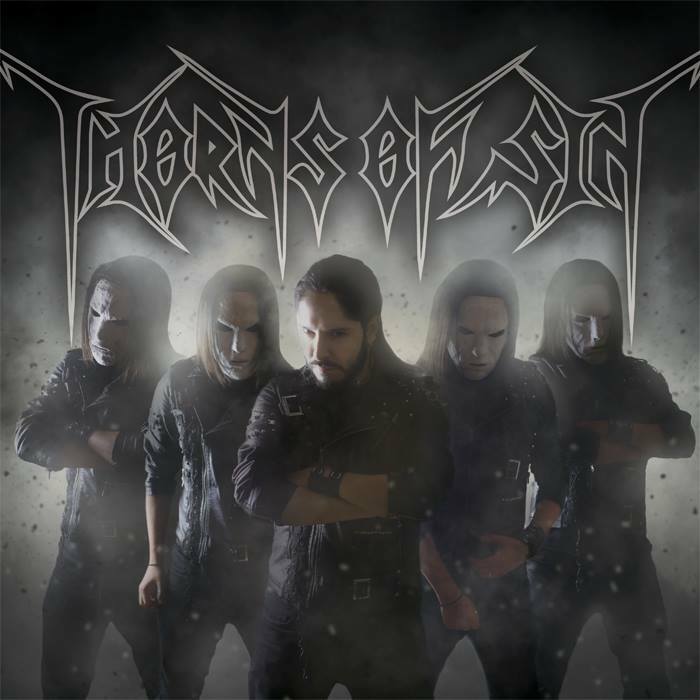 From Los Angeles (U.S.A.) comes a damn interesting and refreshing blackened thrash metal band, its name is Thorns of Sin. This is a long time project of Sergio Varela, a damn skilled and audacious musician! Since 1999 that I follow his work and his ever growing stills, yet now, I must say that this debut album reflects his metal art at its best! Thorns of Sin impressively combine the melody and catchiness of traditional heavy metal music with the aggressive thrash/speed metal solidness and power, all of this with a very darkly extreme metal atmosphere! This band shall please not only those who like traditional heavy metal but also those who venture further into darker and more extreme forms of metal. "Destroy the Light" is a damn impressive debut album, even more since it's a work of one sole creative musician! Musically inspired by several outstanding bands, Thorns of Sin sound combines the heavy metal vibe of bands like King Diamond/Merciful Fate or even Iron Maiden with the ear slashing metal aggression of bands such as Megadeth, Death, Dissection... yet it all blends in perfection with a melodic black metal twist in the vein of Dimmu Borgir or Old Man's Child! It's in fact hard these days to achieve something new, Thorns of Sin have within the years defined their sound as something that is still fresh and easy to identify! "Destroy the Light" has allot of personality and it breathes still fresh upon an already saturated metal world! Sergio Varela vocals are really versatile and give the band some damn great dynamism. Variations from a darkly unclean, sometimes reminding the vocals of Galder (Old Man's Child) or Shagrath (Dimmu Borgir), quickly switching into clean eerie vocals in a King Diamond / Dani Filth (Cradle of Filth) vein! His smashing guitar work, both leads and rhythm have clear inspiration from several guitar heroes such as Marty Friedman (ex-Megadeth), Dave Murray (Iron Maiden), Jeff Loomis (Arch Enemy, ex-Nevermore), Per Nilsson (Scar Symmetry), this just to mention few! The bright use of keyboards as well as the drum and bass sound are a matching fit to the melodic blackened metal sound! Need to mention also that this album solid production was also handled by Sergio V. creative metal-mind! Most probably you will carry out some of the songs in your mind since the very first listening! Even the album is quite uniform in quality, there are songs that clearly reveal the bands identity at its best. The title song "Destroy the Light" is a proof of that, quickly followed by "Lingering souls of Lucedio" and "Lust through the ashes" that are probably the albums best and most addicting 3 tracks, revealing a perfect blend of modern black metal and traditional thrash/heavy metal. "Sounds of discernment" is a powerful melodic dark instrumental that precedes "The philosopher", a damn cool Death cover song. "The truth awakening" is another solid as well as enigmatic cool track featuring Per Nilsson from Scar Symmetry with an impressive virtuous guest solo! This album ends with the darkly twisted "Trapped in the unknown" song! 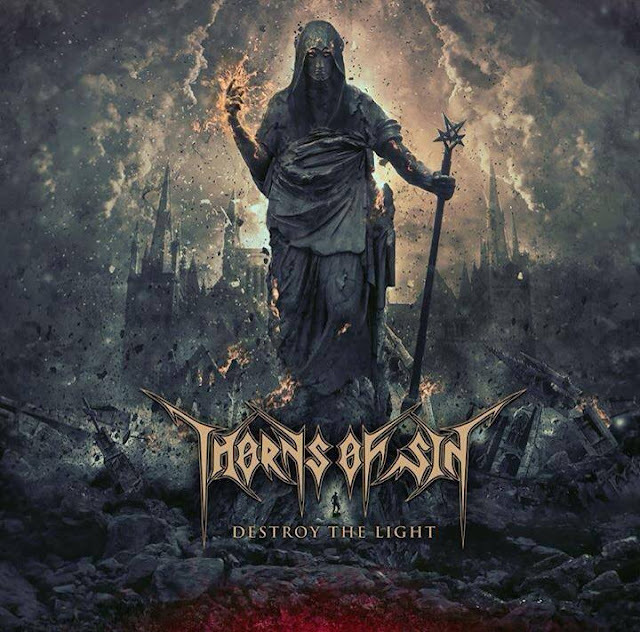 In all "Destroy the Light" is a damn impressive as well as delightful debut album for Thorns of Sin! An album that shall please for its own dynamism and diversity! For fans of heavy, speed/thrash metal as well as open minded black metal fans! A very strong first release that reveals another great musician upon the metal universe! If you seek for a band that blends new and old fashioned metal then probably Thorns of Sin is one of the bands you seek! Ignite the Flame, Embrace Darkness and Destroy the Light!